It’s easy to look at numbers and feel unaffected. So, when we see that there are an estimated five and a half million Americans diagnosed with Alzheimer’s disease, it might not seem that serious. We live in a big country, right? But, if you’re a family member of one of these people, you’re affected just as much. So, every Alzheimer’s diagnosis can fairly be multiplied by two, three or even four. That means at least 11 million people in our country are personally affected by Alzheimer’s right now, maybe even 22 million. That’s a lot of people who most likely need some advice on how to cope. Maybe you’re one of them. So, today I have some crucial tips on what to do if your loved one is diagnosed with Alzheimer’s. The Alzheimer’s Association estimates that family members provide 83% of the long-term care for dementia patients. Wives and daughters take on the role of caregiver in the overwhelming majority of cases, and it can take a serious toll on their mental, physical, and financial health. Just think about it; most of these caregivers have virtually no experience in dealing with somebody with dementia. They may have raised a child or two and been the head of the household, but that in no way, shape, or form can adequately prepare someone for the challenges that lie in caring for a loved one with Alzheimer’s. Alzheimer’s caregivers report higher rates of depression than those who care for family members with other conditions while being twice as likely to experience substantial emotional, financial, and physical troubles. It’s very hard work to care for somebody you’ve known your entire life, and have them not recognize you, notice your efforts, or give any indication that you are the wife, husband, daughter, or son who has been beside them for decades. The distance that opens between dementia patients and their caregivers is incomparable with virtually any other condition. 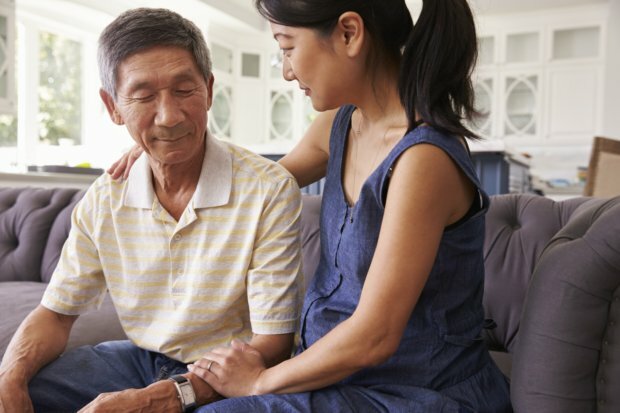 With limited resources in America for Alzheimer’s care and little help available from medical professionals, it’s important that you’re aware of what options you have if you’re ever in the position of caring for a loved one with dementia or Alzheimer’s. The first thing you should do if a family member is diagnosed with dementia is search the Alzheimer’s Association web site. It can provide a host of valuable resources that offer assistance, like respite care and adult day care services to help free up time in your schedule and provide some stress relief. There are a few things you can do to take care of yourself during this trying time. You can build a support network to help you develop coping skills, as well as to provide stress relief and reinforcement. Having people to talk to and doing activities to help you stay healthy are very important. Asking for and accepting help are worth embracing. Giving care to a loved one with dementia is a struggle, especially when you’re inexperienced. Get all the help you can. Making time for yourself is also important. It makes sense that you want to be available 24/7 to your loved one, but it’s not sensible. Scheduling time every day for yourself to do the things you enjoy is central in stress management, life satisfaction, and overall well-being. It’s also essential to stay engaged in your interests and spend time with the other people in your life. One of the hardest adjustments to make is not taking things personally. As your loved one’s mental health deteriorates, they may say or do things that can seem hurtful, and they may forget events, commitments, and other important memories you’ve shared. So, it’s crucial to remember that it’s most likely the disease that’s causing the behavior, and not the person you’ve known for years. Lastly, be engaging with the person to whom you’re providing care. Talking to them, remaining patient, and letting them perform tasks on their own can all help the days pass a little easier. And make them far less stressful. Engagement is key, even if it feels like communicating with a stranger. “Wives, Daughters Shoulder Most of Alzheimer’s Care Burden” MedlinePlus, May 9, 2017; https://medlineplus.gov/news/fullstory_165385.html, last accessed May 16, 2017. “2017 Facts and Figures,” Alzheimer’s Association; http://www.alz.org/facts/, last accessed May 16, 2017. “Early Stage Caregiving,” Alzheimer’s Association; https://www.alz.org/care/alzheimers-early-mild-stage-caregiving.asp, last accessed May 16, 2017.